Our list of thankfuls could go on and on. Bottom line? God is good. Whether we have deserved it or not, most likely the “not” is the correct term, but He is faithful. My Mother, my Grandbuddy, my siblings and their spouses and children. Our children. Their spouses and children. Our friends and loved ones that are far stretching this nation! God has multiplied His love to us in countless ways. He has used YOU to do so! Our blessings are not in “things”, although we rest in a comfortable bed at night. Our blessings are not in food, although we never lack for substance to keep our bodies going strong. Our blessings are not in the material possessions, although I collect books, dust and the occasional bear or snowman. And Jeff collects marbLes. I hope one day if he “feels” as if he’s lost them all, I can empty the jars and show them they are still intact! Our blessings outnumber the problems that only with God’s help, we have been able to overcome in our lives. He has proven His love over and over in many ways. We are grateful. On this Thanksgiving Day, we pause to reflect on the wonders of His grace and mercy. Undeserving we are, yet He keeps on loving us and blessing our lives. Our family table will miss the presence of one darling sister, Wanda. But His table is rejoicing that she is home. Completely well and whole. Her skin is radiant as she reflects His Light and love! Mother, she struggles for breath no longer! Victoria, she will walk up stairs with you! Aimee, we will join her soon! Family members that aren’t ready, prepare yourself. In the moment, any given moment, this life could end. But this living isn’t over. You will live on in either an eternal hell or heaven. Today is a wonderful day to make your choice and stand firm in His love. Accept His free gift~kneel at the cross~offer your life to Him. Repent of your sins~ask Him to come in and “clean house”. You will never be the same, your life will be forever radically changed, once you make HIM Lord of all. To my blogging friends, you have no idea how much like family you feel to me! I would love to have you join us for Thanksgiving Day!! My life will never be the same because of your love and encouragement! From e-mails, cards and notes and even a few phone calls—you are all my sisters in this walk of faith! Thank you! I could not pass this Thanksgiving Week up without thanking Mark. My brother-in-law, who is now my brother. Sort of a Namoi-Ruth story—but with different characters. Our family is your family. Our God is your God and your God ours. We are incredibly thankful for all the ways you have loved our sweet Wanda and the love you have for us. I am thankful that God brought you into our lives and blessed our lives, through you and Wanda with Victoria. And the blessings still come our way. We look forward with great anticipation to what God will bring about in your life in the coming year! We are thankful for the miracle of love. God is good. Thank you Heather~for hosting these thankful hearts this week! I pray that with each post read, hearts will be strengthened and renewed in faith! God bless you all! This entry was posted on Monday, November 24th, 2008 at 1:01 pm	and posted in Holidays. You can follow any responses to this entry through the RSS 2.0 feed. Wonderful Angie! Have a blessed Thanksgiving filled with joy with your family!! Bless you for sharing your precious heart. I love you dear sis, have a wonderful Thanksgiving. Happy Thanksgiving Angie.Your list is precious. There is nothing sweeter than time with family. I’m so sorry Wanda is not there this year. I know how very much you miss her. Have a blessed day with your dear family. One of our greatest blessing is family! Thanks for sharing. Happy Thanksgiving! Happy Thanksgiving to you my friend… I pray that as you gather with family and friends that GOD live large in your midst! I pray that your Thanksgiving Day be a celebration of Thankful hearts … Love ya ! Such a sweet, sweet post! I’m thankful that you are my dear friend and sister of faith!BTW…hope you don’t mind, but I tagged you on my blog. Can’t wait to see what your 6 things are! !Bless you! So much thankfulness~~~ what a wonderful post my friend! And the pictures of you and your sweetie are darling! 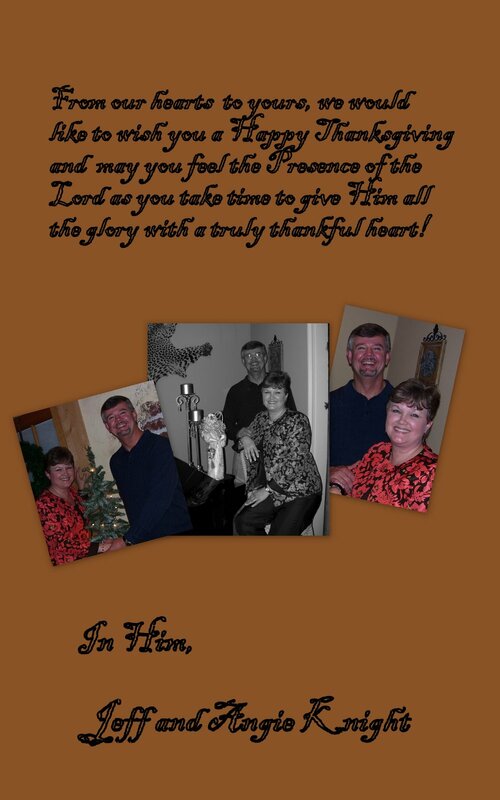 Happy Thanksgiving, Angie, I love your card! Love you, friend. I laughed out loud about you collecting dust & Jeff collecting his marbles…lol. Hope your Thanksgiving was filled with much love. I know you missed Wanda, but when I think of her enjoying such a Heavenly feast, I have to smile. We can't even imagine the joy of seeing Him face to face!Angie, you've been like a sister to me. THANK YOU, dear one.